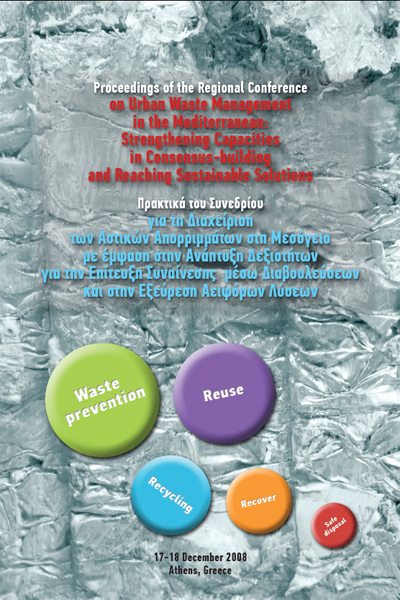 The objective of the present publication is to disseminate as widely and effectively as possible the main outcomes of the “Regional Conference on Urban Waste Management in the Mediterranean: Strengthening Capacities in Consensus-building and Reaching Sustainable Solutions”, that took place in Athens, Greece, on 17 and 18 December, 2008. It is a concrete contribution to the Horizon 2020 Initiative which aims to De-pollute the Mediterranean by the year 2020 and has urban solid waste management as one of its three target areas. The latter requires good understanding of both the technical and socioeconomic aspects related. Furthermore, the publication offers a useful tool to promote the implementation of the Mediterranean Strategy of Sustainable Development and the Barcelona Convention for the Protection of the Marine Environment and the Coastal Region of the Mediterranean. The publication is produced with the financial support of the Hellenic Republic Ministry of Interior and MIO-ECSDE (through its annual support from EC DG Env – LIFE+). The main outcomes and conclusions which reflect the Chairman’s summary of collective views and discussions expressed at the Conference are presented in the form of concrete recommendations within the framework of the key areas identified during the conference. These are the areas in which Mediterranean countries have to focus their efforts in order to improve the current status of solid urban waste management in the region. Also, this publication aims at raising awareness and recording experiences about solid waste related knowledge among the relevant directly involved stakeholders (decision-makers at all levels of national and local authorities, academia, investors, NGOs, etc.) and of the general public.